This blog is well behind. I wrote the first half about a week after I returned but couldn't find a good way to finish. I still don't think it finishes well, but I am feeling the need to blog again. Russia was on the list of places to visit when I decided to do the UK thing. It's tricky to visit on a regular Euro backpacking trip as you need an (expensive) visa with specific entry and exit dates, which is exactly the type of structure I like to avoid when on the road. So when I had the chance to go to Finland for Jukola (it's an orienteering thing, don't ask), it was a logical step to cross the border to St. Petersburg and then mosey on down to Moscow. In a nutshell, both cities totally differed in my expectations. I'd heard rave reviews about St. Petersburg and it is understandable, it's a very impressive city - the Church of Spilled Blood is one of the most impressive pieces of architecture I've ever seen and the tiling facade on the inside puts the Sistine Chapel to shame (in my opinion of course). But there is something about the city that I just didn't click with, it just felt a little soulless. In the same manor that I didn't much care for Rome, it feels like outside of these impressive buildings there is nothing much on offer in the city. The people are grumpy and uninterested in you unless your wallet is open. Tacky souvenir shops line every corner of interest and the parts of the city between the photo worthy spots are bland, poorly maintained and ugly. 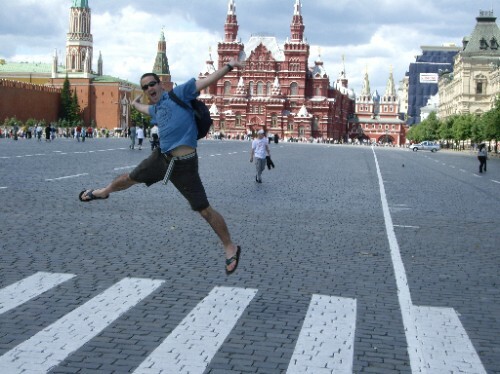 Moscow on the other hand buzzes and has that kind of vibe you associate with New York, Paris or Berlin. We were given unsolicited direction by a local when we were walking from the train station and people actually smiled at you in shops. The wealth in the city is obvious, the GUM shopping centre is jam packed with Prada, Cartier and their Russian equivalents and the construction sites advertising another executive apartment block seem to be everywhere. However, the final bus trip out to the airport and view out of the country from the plane does provide the image of Moscow I was expecting, that of block after block of crumbling grey communist housing highlights out the wealth disparity in Moscow. Two of the main things I was hoping to experience on the trip were some clichéd Russian rudeness and bureaucracy. Luckily enough I got it both on the same day. Defeated we head back to the hostel and the girl at the desk writes us a note in Russian explaining what tickets we want. We head back to the ticket office, join the *other* information line and are waved in the direction of all the windows - it turns out, we can join any queue! So this is when we experience the Russian art, or lack thereof, of lining up for something. You see, each window seemed to have 2 lines, one leading back out from the window and one running along the edge. There would also be people milling about in the vicinity of the window, or sitting in seats near the window and occasionally someone would walk up, peer at the sign in the window, then maybe push into one of the lines, or walk off. No one in the line seemed to care, or notice that someone was pushing in. Judging by the amount of people who came up to us and asked us questions (in Ruski), no one knew what was going on. This is when we cut our losses. Three and a half hours later. The walk to the station passes quickly and we a directed straight to the ticket counter where we purchase our tickets in about ten minutes for an additional fee of about 150 Roubles ($5 or about 3% of the total ticket cost). My one conclusion from this is, given the amount of people in the ticket office is that Russian's value money a lot more than time. The people there may have been buying cheaper tickets and hence the extra fee may have been more significant, but given that most of the major cities in Russia are so far apart, the price of the fee must have been a small fraction of the overall ticket price.